In the latest issue of Flea Market Style, I discovered the amazing work of Amy Flynn. 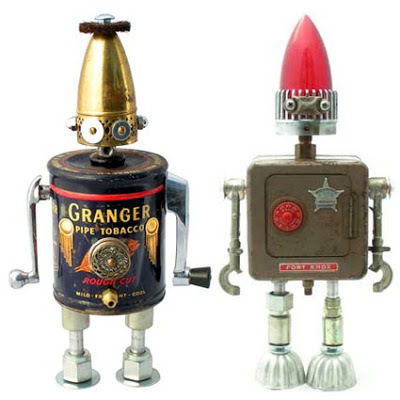 Based out of Raleigh, North Carolina, she makes Fobots; the combination of Found – Object – Robot. 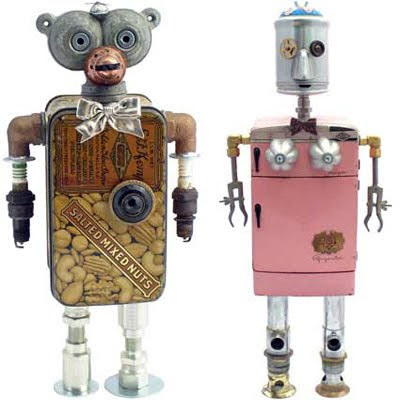 Using forgotten objects that you would find deep in the junk drawer or Dad’s old tool box, she brings Fobots to life with their funky hats and quirky expressions. Amy mainly sells her creations through various art festivals around the United States. Anthropologie (my dream store!) also carry’s her unique and one-of-a-kind Fobots online (as well, they were featured in the November catalog). 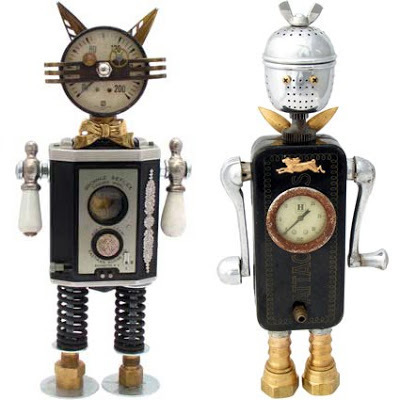 Amy’s eclectic work of Fobots have even had their moment of fame when they were used in an episode of Ugly Betty. How cool is that?! 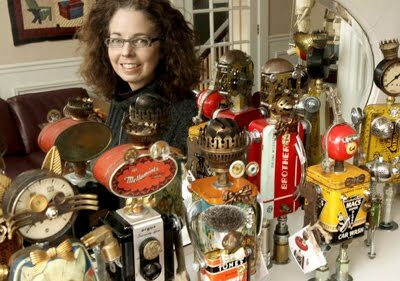 Amy also does custom orders so I am thrilled that she has accepted to make me my very own Fobot with select pieces from my junk collection. The inspiration comes from an old Watkins Black Pepper can from my childhood. My dad loved his black pepper so this is a keepsake in memory of him. Stay tuned for a sneak peak into the goodies that are going to make my fobot, Mr. Pepper. Hi Paige, finally had some time to relax and read some blogs, been so busy planning the show. I hope you'll be able to make it for a visit and make sure you find us & say Hi. We do still have one 6×6 booth inside if you change your mind 🙂 I've added you to my personal blog list and to our Vintage Chicks blog as well. I really believe in promoting local artists. Take care Paige & hope to see you at the show!